or if you haven&apos;t found what you&apos;re looking for, then you can post your own offers. How to search among offers? Navigate to the Trading/Current offers section using the menu. 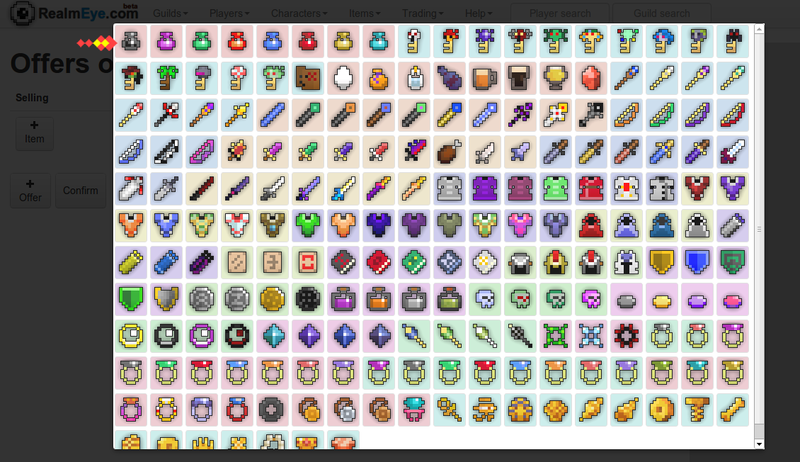 Find the vitality potion, then click on the blue number to see who is buying it. /tell KimMandeok Hello. I would like to trade my vit pot to your def pot. How to post my offers? On your player&apos;s page, there&apos;s a new summary entry: Offers. Click on the link to view your offers. On your offers&apos; page, click on the "Edit" button to edit your offers. Click on the "Add Offer" button at the bottom. A new offer will appear, ready to be edited. Click on the "Add Item" button on the "Selling" side to select the item you want to sell. In this example we will offer a defense potion for two speed potions and a dexterity potion. So, select the defense potion. So far so good. Now add a speed potion to the "Buying" side, then set the quantity of it to 2 by clicking on the button in the bottom right corner. You can use your mouse wheel, or just type the value. Add a dexterity potion to the "Selling" side the same way. If you have multiple defense potions to sell for two speed and a dexterity potion, then adjust the value in the "Qty." column. When you&apos;re done, click on the "Confirm" button. 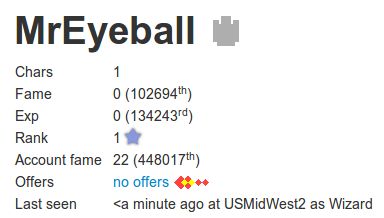 You&apos;ll get a confirmation code which you have to tell to Mr. Eyeball. There&apos;s a complete message prepared and selected for you. Just copy and paste it into the RotMG chat. Reload the page to see your updated offers.